[NAT/LP] [SIZE 1/2" X 3/4"] [3/4" X 1/2" BUSHING] [24V] [WIDTH 4-1/8"] [INCLUDES NAT TO LP SPRING KIT # 51-1227] [1/4" CCT PILOT FITTING] [BRAND HONEYWELL] [MFG# VR8304M3509] FRYMASTER/DEAN FRYER MODEL D20, D50, D50G, D50GDD, D60, D80, FPD565, FPD65, FPD665, KSCF18G GARLAND BAKE/PIZZA OVEN MODEL G56-PB, G56-PT SOLID STATE POCKET GAS DETECTOR N338, # 851101 TEFLON THREAD SEALING TAPE B415, Q-130, # 851109 "GRIPP" HEAVT DUTY THREAD SEALER 1/2 PINT B313, # 851101 PTFE HEAVY DUTY THREAD SEALER 1/4 PINT B768, # 851136. OEM Numbers are used for reference only, see Policies for more details. 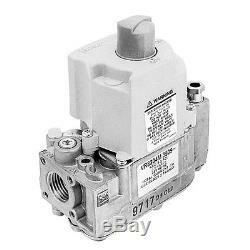 The item "GAS CONTROL VALVE 3/4 24V Frymaster/Dean Fryer Garland Bake/Pizza Oven 541060" is in sale since Tuesday, October 2, 2012. This item is in the category "Business & Industrial\Restaurant & Food Service\Commercial Kitchen Equipment\Cooking & Warming Equipment\Parts & Accessories".